We, as LGBTQ AAPIs, cannot continue to watch Black lives being taken away. We need to show our support through actions, and more than ever, now is the time to have hard conversations about solidarity in our communities. 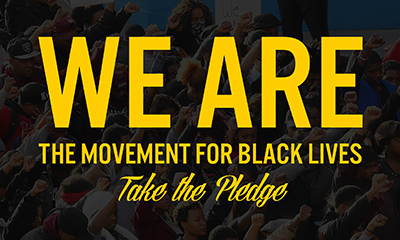 Join the Movement for Black Lives by taking the pledge for solidarity. Although the #BlackLivesMatter movement has grown, so has the violence against it. We must continue to show courage and spread love despite so much unjust, state violence. What is our Place in the Movement? 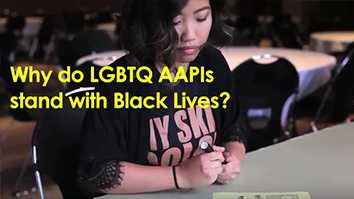 In our QAPIs4BlackLives video, members of the NQAPIA family share painful personal experiences to describe how the QAPI community has been marginalized by police. Watch, listen, and learn why it is necessary to support #BlackLivesMatter. Within many of our families, #BlackLivesMatter is not a topic we discuss. After the deaths of Philando Castile and Alton Sterling, the AAPI community crowdsourced An Open Letter to our Parents about BLM. This letter is a conversation starter to a greater discussion. Not only is this letter in English, but it is also in multiple languages with alternate versions still being created to make this document as accessible as possible. Read some of the Asian versions including Arabic, Bahasa (Indonesian and Malaysian), Bengali, Chinese (simplified and traditional), Farsi, Hindi, Hmong (white and green dialect), Japanese, Khmer, Korean, Tagalog, Tamil, Telugu, Thai, Urdu, and Vietnamese. Sign the pledge. Watch the video. Read the letter. 사랑하는가족중에동성애자, 양성애자또는트랜스젠더(LGBT)가있는부모와가족은많습니다. 사랑하는가족이 ‘커밍아웃’을했을때,그가족들에게궁금한점이생기는건자연스러운일입니다. 이러한궁금증을풀어나가기위한실마리로몇가지중요한사실들을알려드리려합니다. LGBT의정체성을가지게된것은선택한것도, 어떤원인이있는것도아닙니다. 미국으로건너와살게되어서도아니고, 대도시에서살아서도아니고, LGBT 친구들이있어서도아닙니다. 실제로 UCLA 법학대학원의윌리엄스연구소에따르면, 미국에있는아시아태평양계인구중 325,000명, 즉 2.8%가 LGBT 정체성을가지고있다고합니다.어떻게성적지향과성별정체성이결정되는지는아무도정확히알지못하지만, LGBT 사람들대부분은어릴때부터자신이다르다는사실을인지하게됩니다. 죄책감과수치심은많은 LGBT의부모들이초기에공통적으로느끼는감정이지만, 부모때문에자녀가 LGBT가된것은아닙니다. 사람을LGBT로 ‘만드는’ 환경적요인으로확인된것은없습니다. LGBT라는것은그저그사람자체의특성일뿐입니다. 연구에따르면, 가족이이사실을받아들여줄경우건강과행복을촉진하게된다고합니다. 가족의사랑과지지는약물남용, 건강위험요소및자살과같은위험하고자기파괴적인행동을줄여줍니다. 많은 LGBT 사람들이충만하고건강한삶을살수있습니다. 미국을포함한전세계가빠르게변해가고있습니다. 보다많은주와나라에서동성결혼을인정하고있습니다. 윌리엄스연구소에따르면동성관계에있는 33,000명의 AAPI(아시아태평양계미국인) 중 26%가자녀를양육하고있다고합니다. 그뿐만아니라, LGBT 개인들은성공적인커리어를누리고있습니다. 여러비즈니스, 기업, 기관및비영리기관에서 LGBT 직원들을공개적으로지지하고있습니다. LGBT 사람들을환영하며변화를보이고있는신앙과종교가점점더많아지고있습니다. 일부경전의구절들은특정시대의사고방식과문화에맞게기술된것일뿐입니다. 이제여러신앙들은LGBT를포옹하는것이곧연민, 사랑, 자비로운하느님, ‘다른사람에게대우받고싶은대로다른사람을대우해야한다’는믿음과같은강력한종교적/영적가치를중시하는것임을깨닫고있습니다. 많은주와지방의시민권법이 LGBT 사람들을보호하고있습니다. 그러나아직도차이를가지고있는사람들에대한차별가능성은남아있습니다. 인종, 민족, 종교, 출생지, 이민신분, 성적지향또는성별정체성에관계없이공정함과안전, 타인에대한존중이가득한세상을만드는것은우리모두의책임입니다. 당신을위한지원과자원이준비되어있습니다. PFLAG(사랑하는 LGBT 가족을 지지하는 가족과친구들), National Queer Asian Pacific Islander Alliance(NQAPIA) 및 Asian Pride Project와 같은 단체를통해귀하와 가족을 위한 자원을 이용하실 수 있습니다. 자세한내용은www.pflag.org, www.nqapia.org, www.asianprideproject.org에서확인하실수있습니다. Download the Korean leaflet PDF. Watch the Korean PSA video. https://www.nqapia.org/wpp/wp-content/uploads/2015/05/korean.jpg 1650 1275 NQAPIA https://www.nqapia.org/wpp/wp-content/uploads/2016/06/Logo_NQAPIA_and_Tagline_Web-Ver2.jpg NQAPIA2016-05-18 00:26:562016-08-25 15:46:08가족이라는것도, 사랑한다는것도변하지않습니다.